On May 10, 1941, Rudolf Hess, Deputy Führer of the Nazi party, parachuted into Scotland on a mission to finalize a negotiation with England, ending the war in Western Europe and preventing a “fusion” of England with the United States. This would leave Germany free to attack Russia to the East and to allow the Jews to leave for settlements in Palestine rather than be shipped to labor and extermination camps. The mission failed. Hess lived out the rest of WW II in England. Found guilty of crimes against peace and conspiracy to commit crimes at the Nuremberg trials in 1946, Hess spent the rest of his life in Spandau prison under allied supervision, where he was “suicided” in 1987. Or was it really Hess? There is compelling evidence to suggest the man who stood trial at Nuremberg in 1945-46 and then spent 31 years in Spandau prison was not Hess, but a “double.” The efforts to keep “Hess” in prison, tightly under wraps until his assassination, and all information classified to this day have been extraordinary. It’s not that someone wanted “Hess” kept silent – its that everyone wanted him kept silent – the Americans, the British, the Germans, the Russians and the Israelis. 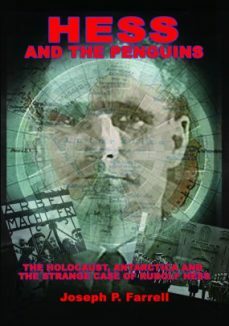 Dr. Farrell leads us through the puzzle palace of the “Hess Mess” with his usual fascinating style in his new book Hess and the Penguins: The Holocaust, Antarctica and the Strange Case of Rudolf Hess. Farrell weaves the known facts with an analysis of the many omissions and cover-ups involved. He tells the tale of the “Hess Mess” and it’s relationship to the British royal family, including the death of the King’s brother, the Duke of Kent, in a plane crash in 1942, Roosevelt’s negotiations with Churchill to enter the war and the Zionist plans for Israel. Farrell covers the Nazi expedition to Antarctica in 1938-39 and the tensions between Nazi Germany and Norway over claims to Antarctica territory. The Nazi’s clearly thought Antarctica was important to their long range plans. So did the United States as evidenced by Admiral Byrd’s expedition to Antarctica under James Forrestal’s direction in 1946-47 immediately after the war. The high strangeness around these events include the mysterious disappearance and death of Admiral Byrd’s son on his way to give a speech about the expedition in Washington and James Forrestal’s “suiciding” – thrown out of a window at Bethesda Naval Hospital. You may ask, “why does the history of the Nazis matter to me?” An analysis of the deep history of the Nazis before, during and after WW II will show you important information about the real governance system on our planet. While you are at it, acquaint yourself with the history of Operation Paperclip in which Nazi scientists responsible for advanced weaponry, mind control and human experimentation were recruited into the upper echelons America’s military industrial and university intelligence complex. One of the ways to best understand the governance system on our planet is immerse yourself in Farrell’s histories of the Nazis. Make sure to add Hess and the Penguins to your collection. This is a fascinating yarn that involves players and mysteries that plague us to this day.